If you're traveling between Rome and Naples, the beautiful Abbey of Montecassino is well worth a visit. 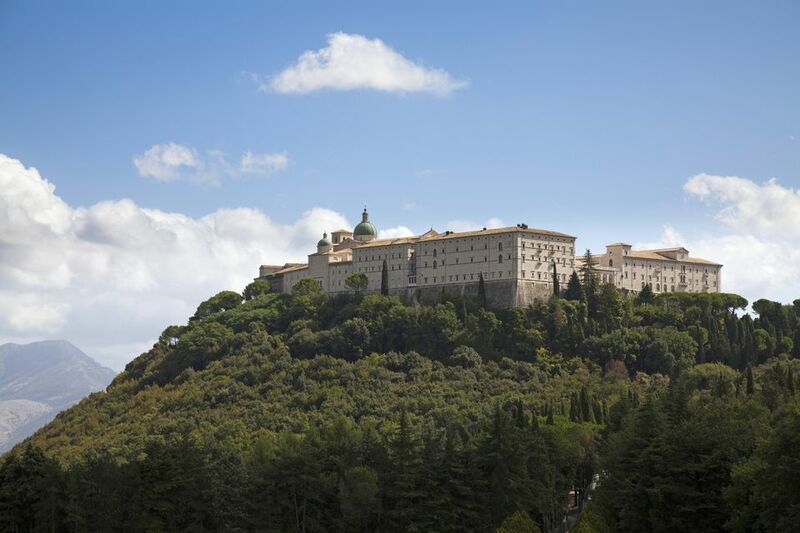 The Abbazia di Montecassino, perched on the mountaintop above the town of Cassino, is a working monastery and pilgrimage site but is open to visitors. Montecassino Abbey is famous as the scene of a huge, decisive battle near the end of World War II, during which the abbey was almost completely destroyed. It was totally rebuilt after the war and is now a major destination for tourists, pilgrims and history buffs. The abbey on Monte Cassino was originally founded by Saint Benedict in 529, making it one of Europe's oldest monasteries. As was common in the early days of Christianity, the abbey was built over a pagan site, in this case on the ruins of a Roman temple to Apollo. The monastery became known as a center of culture, art, and learning. Montecassino Abbey was destroyed by the Longobards around 577, rebuilt, and again destroyed in 833 by the Saracens. In the tenth century, the monastery was again opened and was filled with beautiful manuscripts, mosaics, and works of enamel and gold. After being destroyed by an earthquake in 1349, it was reconstructed again with many additions. During World War II, Allied armies invaded from the south and attempted to push northward and force the Germans out of Italy. Due to its high vantage point, Monte Cassino was mistakenly believed to be a strategic hideout for German troops. As part of a protracted, months-long battle, in February 1944, the monastery was bombarded by Allied planes and completely destroyed. It was only afterward that Allies realized the monastery had been used as a refuge for civilians, many of whom were killed during the bombings. The Battle of Monte Cassino was a turning point in the war, but at an incredibly high cost—in addition to the loss of the abbey itself, more than 55,000 Allied troops and more than 20,000 German troops lost their lives. Although the destruction of Montecassino Abbey remains a tragic loss to cultural heritage, most of its artifacts, including priceless illuminated manuscripts, had been moved to the Vatican in Rome for safekeeping during the war. The abbey was carefully reconstructed following the original plan and its treasures restored. It was reopened by Pope VI in 1964. Today it is hard to tell that it has been destroyed and rebuilt four times. The entrance cloister was the site of the temple of Apollo, made into an oratory by Saint Benedict. Next guests enter the Bramante cloister, built in 1595. In the center is an octagonal well and from the balcony, there are great views of the valley. At the bottom of the staircase is a statue of Saint Benedict dating from 1736. At the basilica entrance, there are three bronze doors, the middle one dating from the 11th century. Inside the basilica are amazing frescoes and mosaics. The Chapel of Relics holds reliquaries of several saints. Downstairs is the crypt, built in 1544 and carved into the mountain. The crypt is filled with stunning mosaics. Before the museum entrance, there are medieval capitals and remains of columns from Roman villas, as well as a medieval cloister with remains of a 2nd century Roman well. Inside the museum are mosaics, marble, gold, and coins from the early medieval period. There are 17th to 18th-century fresco sketches, prints, and drawings related to the monastery. Literary displays include book bindings, codices, books, and manuscripts from the monks' library dating from the 6th century until the present time. There is a collection of religious items from the monastery. Near the end of the museum is a collection of Roman finds and finally photographs from the WWII destruction. Montecassino Abbey is about 130 kilometers south of Rome and 100 kilometers north of Naples, on the mountain above the town of Cassino in the southern Lazio region. From the A1 autostrada, take the Cassino exit. From the town of Cassino, Montecassino is about 8 kilometers up a winding road. Trains stop in Cassino and from the station you would have to take a taxi or rent a car. Visiting Hours: Daily from 8:45 AM to 7 PM from March 21 to October 31. From November 1 to March 20, hours are 9 AM to 4:45 PM. On Sundays and holidays, hours are 8:45 AM to 5:15 PM. On Sundays, mass is said at 9 AM, 10:30 AM and 12 PM and the church cannot be accessed at these times, except by worshipers. Currently there is no admission charge. Museum Hours: The Montecassino Abbey Museum is open daily from 8:45 AM to 7 PM from March 21 to October 31. From November 1 to March 20, it's open on Sundays only; hours are 9 AM to 5 PM. There are special daily openings from the day after Christmas to January 7, the day before Epiphany. Admission to the museum is €5 for adults, with discounts for families and groups. Regulations: No smoking or eating, no flash photography or tripods, and no shorts, hats, mini-skirts, or low-necked or sleeveless tops. Speak quietly and respect the sacred environment. Parking: There is a large parking lot with a small fee for parking. This article has been updated by Elizabeth Heath.